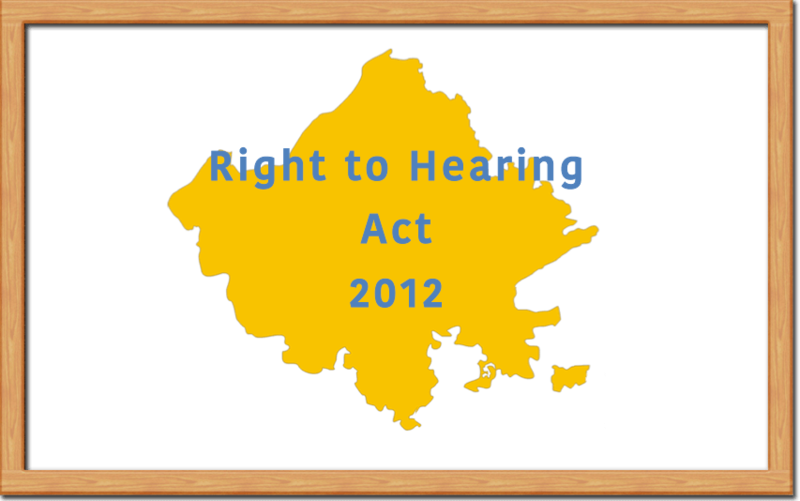 Rajasthan government implemented the Right to Hearing Act on 1 August 2012, with the aim of providing a time-bound hearing and disposal of complaints. The Right to Hearing Act, 2012 complements the Public Services Guarantee Act, which covers 153 services of 18 departments. Along with the Right to Information (RTI) Act, these legislations would lead to governance with accountability and transparency. On receipt of complaint, a unique registration number shall be given on each complaint by the Public Hearing Officer or person who receive the complaint. Every Public Hearing Officer shall fix at least two days in a week for hearing of the complaints received under the Act. No fee shall be payable along with complaint, memo of first appeal or second appeal and revision application. Provision for Citizens to get an opportunity for hearing their grievance near their residence like the gram panchayat, tehsil, sub-division or district level. It shall be mandatory to hear the complaints and dispose them within a stipulated time Public hearing officers (PHO) and appellate authorities have been formed. Where the second appellate authority is of the opinion that the Public Hearing Officer has failed to provide an opportunity of hearing within the stipulated time limit without sufficient and reasonable cause, it may impose on him a penalty which shall not be less than five hundred rupees but which shall not exceed five thousand rupees.